Weyl invariant gravity has been investigated as the fundamental theory of the vector inflation. Accordingly, we consider a Weyl invariant extension of Dirac-Born-Infeld type gravity. We find that an appropriate choice of the metric removes the scalar degree of freedom which is at the first sight required by the local scale invariance of the action, and then a vector field acquires mass. Then non-minimal couplings of the vector field and curvatures are induced. We find that the Dirac-Born-Infeld type gravity is a suitable theory to the vector inflation scenario. The cosmological inflation is proposed as some resolutions for the important cosmological problems, e.g. the flatness, horizon and monopole problems. Most of successful models are based on classical scalar fields, although we have not observed such scalar bosons associated with the field. The inflation can also be caused by other type of fields. The vector inflation has been proposed by Ford  and some authors [2-4]. It is emphasized that the massive vector field should non-minimally couple to gravity in such models [1-4]. which is very similar to the equation for a homogeneous scalar field in the Friedmann-Lemaître-Robertson-Walker universe. Moreover, the energy density is expressed as ~ , which is also similar to the one for the scalar field. Thus, the slow evolution of the effective scalar field Bi can occur in the approximately isotropic inflating universe. We have studied  Weyl invariant gravity [6-39] as a candidate for the theoretical model of the vector inflation. We found that the choice of the frame yields the mass of the Weyl gauge field, but the non-minimal coupling term is lost . We come to the conclusion that we need further generalization of the gravitational theory. where Rμν is the Ricci tensor and the α is a constant. Originally, electromagnetism of the DBI type has been considered as a candidate of the nonsingular theory of electric fields. Therefore the Dirac-Born-Infeld-Einstein theory as the highly-nonlinear theory is also expected as a theory of gravity suffered from no argument of singularity. The studies on the theory have been done by many authors [41-50]. Because of the nonlinearity in this theory, we expect the extension as the theory of gravity which realizes a successful vector inflation. yields the terms RAμAμ and RμνAμAν and so on as well as R and FμνFμν. Other Weyl invariant terms are necessary, because the metric tensor must be combined with a scalar field which compensates the dimensionality. After the frame choice, the freedom of the scalar field is eaten by the vector field, then, the presence of the non-minimal terms mentioned above is still realized2. In the next section, we review the Weyl invariant gravity with the vector field [11-14,16-21,25-37]. The expression (1.4) is generalized to the Weyl invariant one. The Lagrangian for a Weyl-invariant DBI gravity is proposed in Section 3. In Section 4, the necessity condition for the vector inflation is investigated. In Section 5, another possible inflationary scenario is provided. The last section is devoted to the summary and prospects. In this section, we review the Weyl’s gauge transformation to construct the gauge invariant Lagrangian. where is an arbitrary function of the coordinates xμ. where Aμ is a Weyl’s gauge invariant vector field. Although we can use the Weyl invariant Ricci tensor in the DBI gravity, we should note that the metric tensor in the action is not Weyl invariant (which is shown in (2.1)). Thus, we use a combination instead of the metric tensor. The scalar Φ compensates the dimension of the metric. Now the use of and in the DBI type action leads to the theory of gravity, a vector field, and unexpectedly, a scalar field. Another notice is in order. The decomposition of a rank two tensor shows that there are three irreducible ones; an anti-symmetric tensor, a traceless symmetric tensor and a trace part. We choose those as symmetric tensors are not traceless3. where α1, α2, β, γ1, γ2, γ3, γ4 and λ are dimensionless constants4. This is the candidate Lagrangian for the vector inflation. In this section, we apply our Weyl invariant DBI theory of gravity to cosmology in four dimensions (D = 4). and, moreover, we assume the approximate isotropy . We consider that only A1(t) is homogeneously evolving, and A2 = A3 = A0 = 0. A simple case is realized when α2 = γ1 = γ2 = γ3 = γ4 = 0, or these parameter take small values in comparison with α1. Then the parameter is α1 only. Equations (4.7) and (4.8) tell us , and . In this case, this is so simple that the effective mass for B1 may be large. The tuning is possible; say, the choice of γ4 does not affects (4.8) and makes the change in the effective mass. An elaborate tuning may give the potential which induces the chaotic inflation . In the next section, however, we show another simple inflation scenario. The chaotic inflation in the model can occur by tuning of the parameters. We should remember that the model involves the higher-derivative gravity. Therefore another kind of inflation is worth to be considered. This is the simplest potential. In the true vacuum, the vector field “condensates” and a “natural” choice λ = 1 leads to vanishing cosmological constants6! This simplest version also has an inflationary phase. That is, for B1 = 0, the scale factor behaves as a(t) ≈ eHt where . The exit of the de Sitter phase is problematic, like the other higher-derivative models. Though the additional matter fields may play important roles, we will perform further study on them elsewhere. The Weyl invariant DBI gravity is a candidate for a model which causes an inflationary universe. If the vector inflation can explain the possible anisotropy in the early universe, we may seriously investigate the Weyl invariant DBI gravity. Here we examined slow development of the massive vector field. The inflation along with a fast evolution is shown to be possible in the DBI inflation, where the scalar degrees of freedom which originate from string (field) theory or D brane theory [52,53]. The similar scenario is feasible in our model, though the higher-derivatives make the detailed analysis difficult. Anyway, numerical calculations and large simulations will be needed to understand the minute meaning of the Weyl invariant DBI gravity, because the local inhomogenuity in the spatial directions as well as the strength of vector fields is important for thorough understanding in the early cosmology. Finally, we think that some marginally related subjects are in order. The higher-dimensional cosmology in the Weyl invariant DBI gravity is worth studying because of its rich content. Incidentally, DBI gravity in three dimensions is eagerly studied [54-57], which is related to New Massive Gravity [58,59]. We think that the Weyl invariant extension of the lower-dimensional theory is also of much mathematical interest. 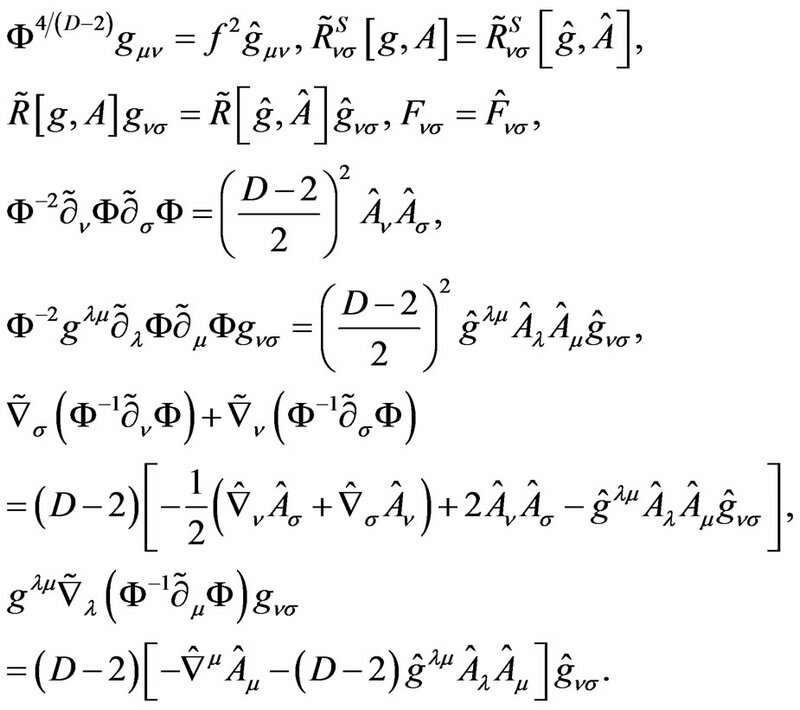 After completing this manuscript, we become aware of the paper “Higgs mechanism for New Massive gravity and Weyl invariant extensions of higher derivative theories” by Dengiz and Tekin . They investigated a Weylinvariant DBI gravity in three dimensions. We also become aware of two recent papers about the cosmology of Weyl invariant theory [61,62]. The authors would like to thank the organizers of JGRG20, where our partial result ([arXiv:1012.5375]) was presented. We also thank D. Comelli, S. Deser, T. Moon and B. Tekin for informing us about their important and interesting papers. The present study is supported in part by the Grant-inAid of Nikaido Research Fund. L. H. Ford, “Inflation Driven by a Vector Field,” Physical Review D, Vol. 40, No. 4, 1989, pp. 967-972. A. Golovnev, V. Mukhanov and V. Vanchurin, “Vector Inflation,” Journal of Cosmology and Astroparticle Physics, No. 6, 2008. T. Maki, Y. Naramoto and K. Shiraishi, “On the Cosmology of Weyl’s Gauge Invariant Gravity,” Acta Physica Polonica B, Vol. 41, No. 6, 2010, pp. 1195-1201. P. A. M. Dirac, “Long Range Forces and Broken Symmetries,” Proceedings of the Royal Society A, Vol. 333, No. 4, 1973, pp. 403-418. H. Cheng, “Dark Matter and Scale Invariance,” 2004. W. F. Kao, “Scale Invariance and Inflation,” Physics Letters A, Vol. 154, No. 1-2, 1991, pp. 1-4. M. Pawlowski, “Gauge Theory of Phase and Scale,” Turkish Journal of Physics, Vol. 23, No. 5, 1999, pp. 895-902. H. Nishino and S. Rajpoot, “Broken Scale Invariance in the Standard Model,” hep-th/0403039. H. Nishino and S. Rajpoot, “Standard Model and SU(5) GUT with Local Scale Invariance and the Weylon,” arXiv: 0805.0613 [hep-th]. H. Wei and R.-G. Cai, “Cheng-Weyl Vector Field and Its Cosmological Application,” Journal of Cosmology and Astroparticle Physics, No. 9, 2007. 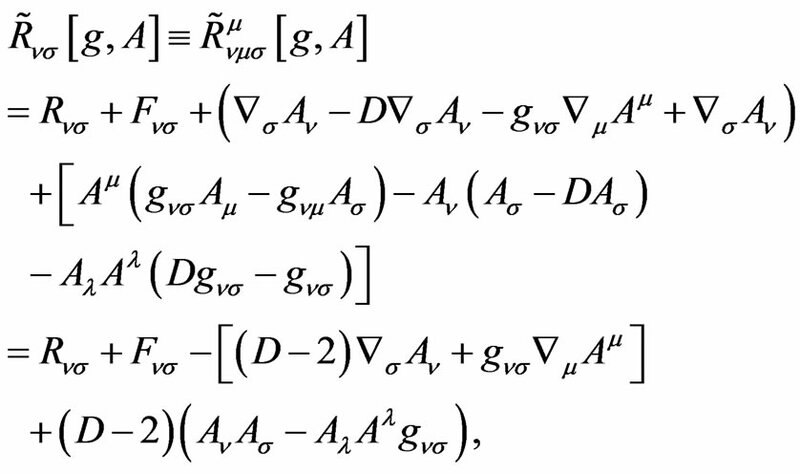 P. Jain, S. Mitra and N. K. Singh, “Cosmological Implications of a Scale Invariant Standard Model,” Journal of Cosmology and Astroparticle Physics, No. 3, 2008. P. Jain, S. Mitra, S. Panda and N. K. Singh, “Scale Invariance as a Solution to the Cosmological Constant Problem,” arXiv:1010.3483 [hep-ph]. D. N. Vollick, “Black Hole and Cosmological SpaceTimes in Born-Infeld-Einstein Theory,” gr-qc/0601136. D. Comelli and A. Dolgov, “Determinant-Gravity: Cosmological Implications,” Journal of High Energy Physics, No. 11, 2004. M. Alishahiha, E. Silverstein and D. Tong, “DBI in the Sky,” Physical Review D, Vol. 70, No. 12, 2004, Article ID: 123505. T. Moon, P. Oh and J. Sohn, “Anisotropic Weyl Symmetry and Cosmology,” Journal of Cosmology and Astroparticle Physics, 2010, arXiv: 1002.2549v3. 1Of course, only the vector field as the source cannot lead to the exactly isotropic expansion. 2Note that does not bring about substantial nonminimal couplings . 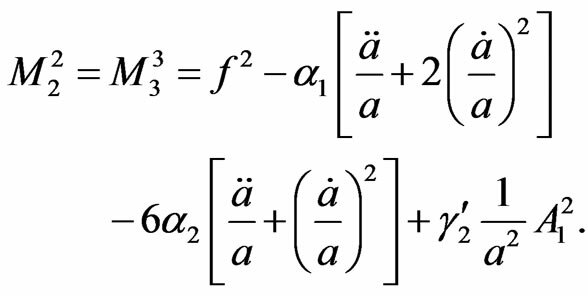 3Judging from the number of fields and derivatives, the term Φ−4/(D−2) gλμFνλFσμ is allowed in the same order. But this term is different from others in the point that it includes two kinds of fields except for the metric. Therefore we discarded this marginally possible term here. 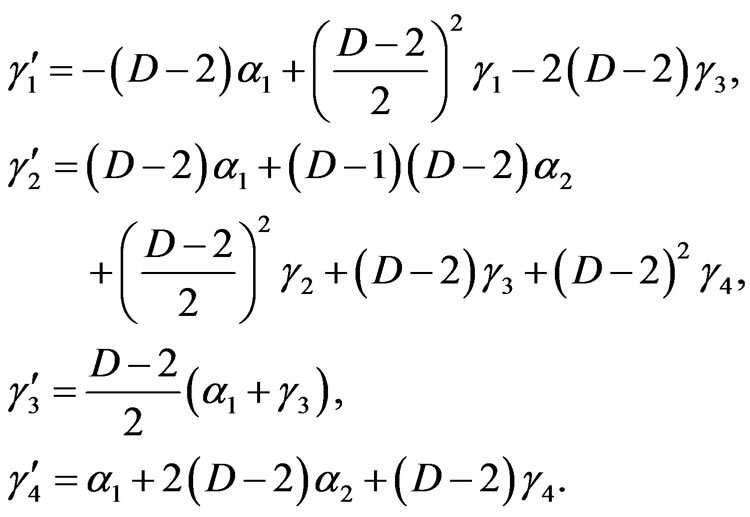 4If we demand that the terms with lowest derivatives in the expansion (1.6) look like the Lagrangian of scalar-tensor theory, we must choose as α1 + 4α2 > 0 and γ1 + 4γ2 + 4γ3 + 8γ4 > 0, for D = 4. 5Note that can be tuned by take an appropriate value for γ4. 6The parameters s can be taken to be sufficiently small so that no “antigravity” emerges.